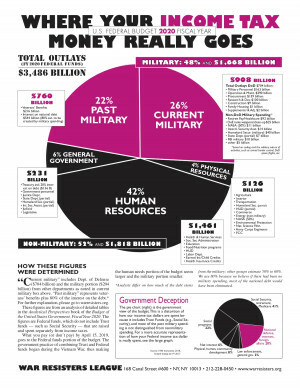 The War Resisters League’s pie chart flyer: “Where Your Income Tax Money Really Goes” has been updated for the proposed 2020 federal budget. The flyers, which show about half of the federal non-trust-fund budget going to pay for past and present military-related expenses, are good conversation-starters, especially during tax season as people in the United States tally up how much they’ve been contributing to this budget over the year. NWTRCC is keeping a running tally of “Tax Day” actions taking place in the U.S.
Spanish war tax resisters are also in the middle of their tax season activities. They recently staged a demonstration at the port where a military aircraft carrier was docked. Here’s some video of the demo as well. The head of the police in Paris was dismissed and the government brought in the army, while banning protests in French cities, as it attempts to quell the frequent outbreaks of gilets jaunes protests. Meanwhile, the destruction of traffic cameras continues in France, and to a lesser extent elsewhere.